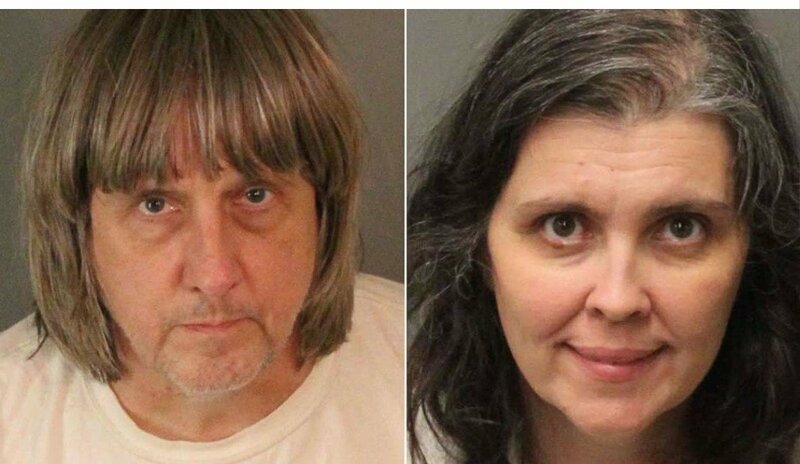 Southern California parents 56-year-old David Allen Turpin and 49-year-old, Louise Anna Turpin, have both been arrested and charged with suspicion of torture and child endangerment. They are currently been held on $9 million bail each after a horrific discovery over the weekend at a residence in Perris, the Riverside County Sheriff’s Department said Monday. An investigation began after a 17-year-old girl escaped from the home early Sunday morning and called 911 to report that her 12 brothers and sisters ages 2 to 29 were being held captive by their parents. When responding officers initially saw her, they thought the “slightly emaciated” girl was only 10 years old until she provided proof that she was actually 17 years old. After interviewing the teen, investigators went to the residence and contacted her parents, according to a release by the sheriff’s office. Investigators discovered “several children shackled to their beds with chains and padlocks in dark and foul-smelling surroundings,” the release said. The parents could not provide a “logical” explanation for why the kids were restrained, investigators said. Authorities located what they thought were 12 children but were “shocked” to find out seven of them were adults. In all, the victims are between the ages of 2 and 29, the release stated. They looked to be malnourished and filthy, authorities said. The victims were taken to the Riverside County Sheriff’s Department’s Perris Station for interviews; they were provided food and drink after telling investigators they were “starving,” according to the release. Both parents were detained while child and adult protective services responded to assist in the investigation. After being interviewed, they were each booked at the Robert Presley Detention Center on the release said. David Turpin’s parents, James and Betty Turpin of West Virginia, told ABC News they are “surprised and shocked” by the allegations against their son and daughter-in-law. James and Betty Turpin said they hadn’t seen their son and daughter-in-law since visiting them in California some four to five years ago. However, they said they have kept in touch with them by phone since. They told ABC News they had not spoken to their grandchildren, saying David Turpin or his wife would often call when they were without the children, who are homeschooled.